For many years now, I have been interested in how personalities tacitly shape interactions between scientists. While science is generally viewed as an objective activity, I have repeatedly been struck along my scientific career by how self-centered scientists with a big ego (i.e. high in narcissism) are often the most successful. Reading about social personalities and evolutionary psychology, I have tried to decipher how social dominance influences interactions between scientists within their community. 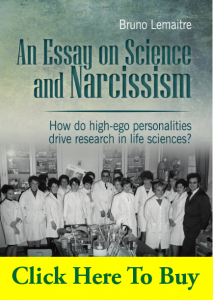 This travel through emerging fields of psychology has been summarized in a book entitled “An Essay on Science and Narcissism: How do high-ego personalities drive research in life sciences?”. This book is an attempt to compile many implicit factors that are often the focus of informal discussion at meetings but rarely conceptualized. It also provides an overview of our knowledge of the narcissistic personality as well as insights into how the recent increase in narcissism in Western society, which is of great concern for its sustainability, could explain many ethical issues that have arisen in science. Since I could not find an editor interested in the manuscript, this book is published as an auto-edition and can be obtained via internet. I am still exploring ways to diffuse it at a cheaper prize worldwide. If you enjoyed it, do not hesitate to spread the information among people interested in personality and science! An abstract of the book and comments can be found here. The book is available on this website (distributed worldwide by the author from Switzerland France) with a secure payment via credit card or Paypal. The price is especially attractive for France (22€) and Switzerland (20.5€). Europe: 25€ and World: 27.5€. The book is available on Amazon.fr (22.5€), Amazon.it (23.5€), Amazon.es (23.5€) and Amazon.de (23.5€), Amazon.com (30$ USA) and Amazon.ca (34CDN$ Canada) in print format. The book is available worldwide in Kindle (9.9$) format. Paris: Librairie Eyrolles (55-63 Bld Saint Germain Vème, 18€). For the EPFL Life Science community, the book can be obtained at room SV3837 at office hours (20.- CHF).